A Madrid-shot Spanish short – from the talented director of INTO THE MUD – that celebrates and quotes from keynote modern American horror films. 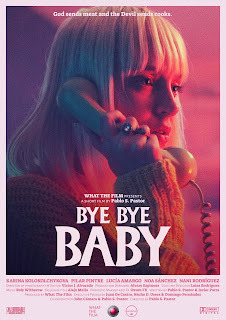 Karina Kolokolchykova can’t quite convince as either a typical American teenager or a virgin in the central role of a young woman menaced in her family home by an invasive, evil presence whose appearances coincide with the eponymous old song playing on the radio. The widescreen framing, domestic environment and Kolokolchykova’s appearance all distractingly duplicate the opening victimisation of Casey Becker in SCREAM, and the character names nod to significant genre females (Jamie, Heather, Casey). Meanwhile, there are overt homages to the hijacked television set of POLTERGEIST and the cackling hag of THE SHINING, plus scenes from William Castle’s HOUSE ON HAUNTED HILL playing on the TV. The retro style – encompassing refreshing rotary telephones – is endearing, though the fanboy reference points are old hat, robbing the film of its identity. Technically, it’s terrific, with impressive cinematography and an evocative string-dominated score. With stronger material, Pastor’s filmmaking career in either short or feature formats seems assured. 'BYE BYE BABY' SHORT FILM OFFICIAL TRAILER from Pablo S. Pastor on Vimeo.